Overall the market grew 64% last Q, with Apple maintaining share y/y even though transitioning to a new model and draining channel during several weeks. Android continued to experience over 8x growth which is phenomenal. 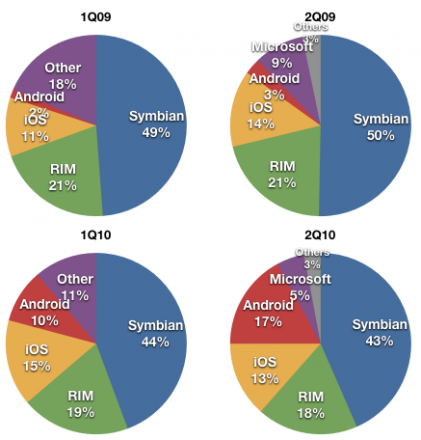 Share was taken mostly from incumbent Nokia (-7), Microsoft (-4) and RIM (-3), though bear in mind that the whole pie grew by nearly 70%. 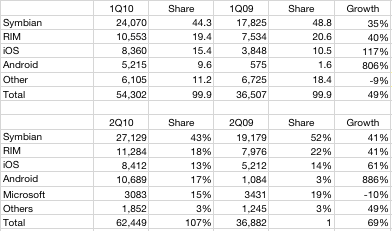 Canalys OS share data has become available and I’ve updated the charts and table.